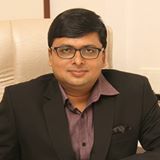 Shri K.P.Pathak, learned counsel for the applicant. Applicant filed a Criminal Complaint Case before the JMFC, Jabalpur. After affording the opportunity, the applicant could not deposit the requisite court fees and, therefore, vide order dated 17.1.2017, learned JMFC dismissed the complaint. The complainant submits that because the complainant was to deposit the court fees, but due to financial insufficiency suffered by him, he could not make the deposit at the relevant time. It is also contended that during the said period, the Demonetisation was also in force, therefore, his non-deposit of the court fees be condoned and setting aside order dated 17.1.2017 passed by the learned JMFC, time may be granted to deposit the court fees. It is true that Demonetisation was in effect from October, 2016 to December, 2016. The applicant has filed the criminal complaint case for dishonour of cheque of Rs. 1,00,000/- dated 5.4.2015. Considering the circumstances, taking a liberal view, application is allowed. Setting aside order dated 17.1.2017, it is directed that, if the applicant deposits the requisite court fees within a period of one week from today, the criminal complaint case be restored to it’s original number and to proceed in accordance with law.